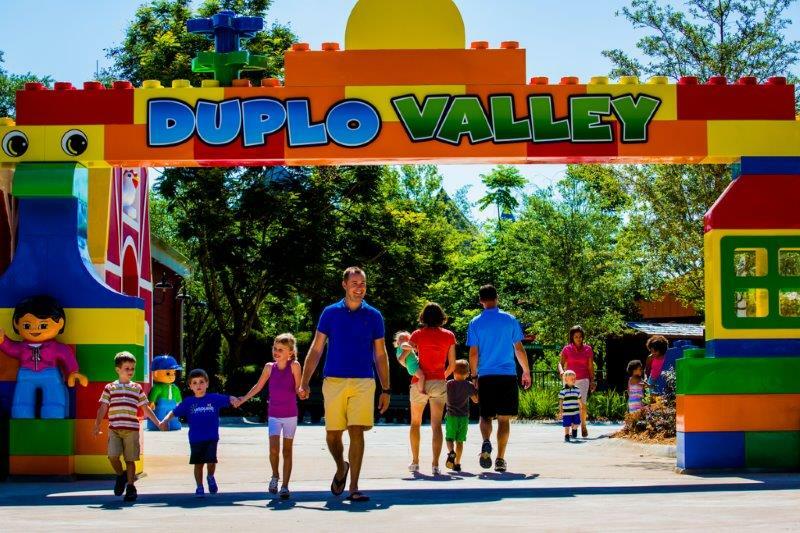 New attractions within DUPLO Valley include a train, a mini tractor ride, and a water play area. The central feature is the DUPLO Train where toddlers can board a train on their own or with their parents to explore countryside-themed scenery passing through farms, fishing holes and campgrounds. Just across the way, toddlers can jump on a tractor just their size and help the farmers plow the cornfields and hunt for missing farm animals. For those looking to cool off, the new splash and play area will be refreshingly fun with intermittent water spouts and interactive water elements set among larger than life farm animals with a soft deck for safety. Toddlers can board a train on their own or with their parents to explore countryside-themed scenery passing through farms, fishing holes and campgrounds. Height Requirement: Guests under 34″ must ride with a responsible person 48″ or taller, guests 34″ and above may ride unaccompanied. Handheld infants are not permitted. An air-conditioned play area for children to slide, climb and crawl around a whole host of friendly farm animals. Toddlers can ride on a tractor just their size and help the farmers plow the corn fields and search for missing farm animals. Height Requirement: Guests under 42″ can ride with a responsible person 48″ or taller, guests 42″ and above can ride unaccompanied. Handheld infants are not permitted. Fun, refreshing play area with intermittent water spouts and interactive water elements set among larger than life farm animals with a soft deck for safety. DUPLO Tot Spot is designed specially for children under the age of two and features a small slide and colorful playhouse. This a fun, exciting play area that is safe and secure for our youngest DUPLO guests. Toddlers and parents alike can enjoy hot and fresh popcorn or caramel popcorn, as well as cool, refreshing drinks at the DUPLO Snack Bar. The Baby Care Center, presented by Winter Haven Hospital, provides a nursing and changing area, bottle warming and more! Located inside the Duplo Farm.